We always have fresh mulch in stock. We usually get shipments in about once a week to ensure its as fresh as possible. 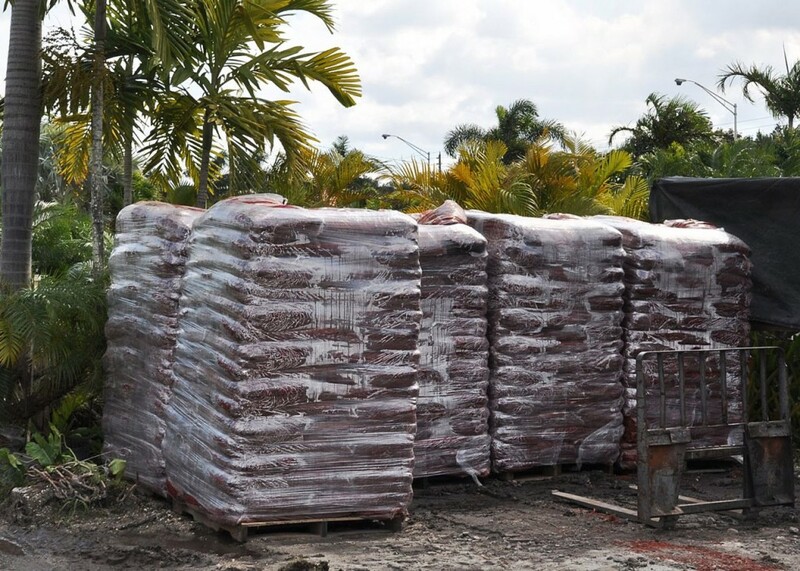 This mulch is a superior brand and is a professional mulch that most landscapers and contractors use. This mulch is known for keeping its red color as long as possible. Usually our customers redo their mulch once or twice a year to keep it looking bright and good. Our red mulch sells for $2.15 / bag and roughly covers about 10 sq.ft. at about 2″ thick. Our pallets carry 80 bags. Each pallet covers about 800 sq.ft. For optimal weed growth suppression, a 4″ layer of mulch is recommended. In addition to the red we carry gold, and natural cypress. The cypress is used in areas where chemical free and natural options are needed. This cypress type sells for $2.00/ bag being our most economically priced. In addition to mulch, decorative rocks and sod can be used as ground covers if wood chips are not the preferred option. Mulches cover the soil and modify the extremes of soil temperature and serve to unify the landscape design. A 4in layer minimizes evaporation, reduce weed growth and slow erosion. Organic mulches, like wood chips or bark, can be incorporated into the soil. Non-organic mulches, rocks and gravel are another choice. Some dry land plants actually prefer gravel mulches or decorative rocks.